Gene went on to star in many well-known comedies: Blazing Saddles, Young Frankenstein, Stir Crazy, Silver Streak and many others. His role as candy maker Willy Wonka in Willy Wonka and the Chocolate Factory will likely never be forgotten. The library owns a number of Gene Wilder’s Films and books. You did know he was also a writer, didn't you? The link below will create a list of items to choose from. He will be missed. January 14, 2016 marked the passing of Alan Rickman. Rickman was best known in recent years as Severus Snape in the Harry Potter Movies. One of his earliest roles to command attention was that of the villain Hans Gruber in the first Die Hard. You might also remember him as Alexander Dane in Galaxy Quest, the classically trained actor resigned to be forever remembered for playing an alien in a television series. Like his Galaxy Quest character Alan Rickman was a classically trained actor who was equally at home on stage as he was on screen, though he preferred the stage and often passed up choice movie roles to appear on stage. The link below will provide a list of films and other materials featuring Alan Rickman. On January 10th of this year we lost one of the most the most innovative musical performers of the late 1960’s on: David Bowie. David Bowie managed to re-invent his stage persona and musical style to fit the times and keep himself relevant. Bowie was not just a talented musician and singer. He was also a talented actor and he starred in a number memorable and now classic films. In his first major role his acting ability and unique looks brought the alien character of Thomas Jerome Newton to a life in The Man Who Fell to Earth. And few who have seen the film Labyrinth can forget him as the King of the Goblins in his M.C. Escher inspired castle. Below I have provided a link which will bring up a list of Monroe County Public library’s holdings wish feature the music, writing or acting talent of David Bowie. Mr. Bowie, you will be missed. Glen Campbell: I’ll Be Me. The sound of a projector is heard as an old 8mm home movie is projected on to a screen. They show a young father playing with his children, making faces at the camera, laughing and enjoying his life. The camera pulls back behind an older couple watching the film from their couch. Then a close up. The older man is biting his upper lip then asks, “Who is that?” “That’s you honey” comes the reply. A pause then, “Oh, there I am.” And he laughs. Another pause, “Who’s that with me?” “That’s your daughter. Your first daughter Debbie.” And so begins this 2014 documentary on the life of Glen Campbell, now in his 70’s, struggling with Alzheimer’s and preparing to go on one last farewell tour. Read more about Glen Campbell: I’ll Be Me. The month of October is one of the most popular months for watching films of the horror genre. It also seems a suitable time to post a tribute to the August 30th passing of director Wes Craven who did much to influence the direction of the modern horror film. His 1984 Nightmare on Elm Street introduced Freddy Krueger, one of the longest lasting and memorable horror characters since Boris Karloff’s monster in the 1931 movie Frankenstein. In 1996 he introduced us to “Ghostface” in Scream, a second horror creation destined to become almost legend. 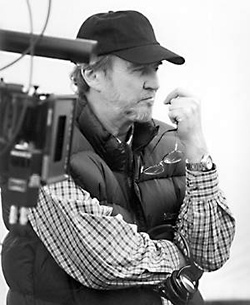 Yet it would be wrong of us to limit Wes Craven’s talent to only the horror genre. He was also known for films such as Music of the Heart starring Meryl Streep as a music teacher struggling to teach violin to inner city children and as one of twenty directors of Paris, je t’aime a collection of stories about the city of love. This month is a perfect time to explore the legacy of films that we have been left by this notable director. The link below will create a list of DVDs owed by the Library for your enjoyment. “I was never deeply interested in being a child.” Twentieth-century war correspondent and novelist, Gellhorn always said these words would open her autobiography if she ever wrote one. Unfortunately, she never did but Moorehead’s deeply researched biography of the writer is so rich with Gellhorn’s work, family life, love affairs, and travels that probably not even Gellhorn could have gotten it down with such precision. Also, Moorehead provides a rich tapestry of historical and cultural information for the nine decades of Martha’s life. During WW 11, the military refused to give her a pass to Normandy for the German invasion, so Martha sneaked aboard a troop ship and hid in the bathroom until they were well at sea.